The presence of bilateral cleft lip and palate has the potential to significantly alter facial form and structure. The central third of the face is distorted by the bilateral cleft, and restoring the normal facial form is one of the primary goals for the reconstructive surgeon. Preoperative and postoperative images of a child born with a complete bilateral cleft lip and palate. The history of bilateral cleft lip repair has evolved from discarding the premaxilla and prolabium and approximating the lateral lip elements to a definitive lip and primary cleft nasal repair utilizing the underlying musculature. Accompanying the evolution of surgical repair is the increasingly important role of orthodontic support with early presurgical alveolar and nasal molding. Repositioning the maxillary and alveolar segments into a more anatomic position allows the surgeon to repair the lip and associated nasal deformity under more optimal conditions. The reader is referred to the references cited for a more detailed historical review of individual repairs and supportive management. The cleft affects the obvious facial form as an anatomic deformity and has functional consequences, affecting the child's ability to eat, speak, hear, and breathe. Consequently, rehabilitation of a child born with a facial cleft must involve a multidisciplinary approach and be staged appropriately with the child's development. The need for intervention must be balanced against its subsequent effect on normal growth. In the child born with a bilateral cleft, the surgeon initially is faced with a protrusive premaxilla and the difficulty of achieving adequate columellar length and vertical height to the lip during reconstruction. 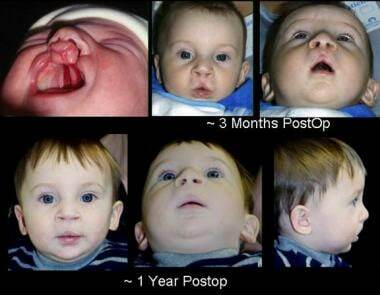 Bilateral cleft lip repair. (A) The prolabial width is typically set at 4-5 mm. (B) The prolabial flap is elevated to the base of the columella. The adjacent flaps are turned over to create a labial sulcus. (C) The orbicularis oris muscle, dissected from the overlying skin, is approximated across the midline. (D) The skin is approximated, and the Cupid's bow is created from the lateral vermilion flaps. The overall occurrence of cleft lip with or without cleft palate is approximately 1 in 750 to 1 in 1000 live births, establishing it as one of the most common congenital anomalies. [2, 3] Incidence varies by race, with clefts occurring more commonly in Asians (1 in 500 births), less frequently in whites (1 in 750 births), and even less frequently in African Americans (1 in 2000 births). These racial variations in incidence are not observed with the isolated cleft palate. In terms of gender, the incidence of cleft lip/palate is more common in males, while the incidence of cleft palate alone is more common in females. The most common presentation is cleft lip and palate (approximately 45%), followed by cleft palate alone (35%) and cleft lip alone (approximately 20%). Unilateral cleft lips are more common than bilateral cleft lips and occur more commonly on the left side (left cleft lip:right cleft lip:bilateral cleft lip - 6:3:1). In a large series reported in the literature, bilateral clefts are observed in approximately 15% of patients with clefts. [5, 6, 7] . This translates to an overall incidence of approximately 1 in 5000 to 1 in 6500 births. According to the American Society of Plastic Surgeons (ASPS), 18,859 cleft lip and palate reconstructive procedures were performed in the United States in 2007. These statistics include procedures performed by ASPS members as well as other board-certified physicians most likely to perform plastic surgery procedures. Environmental causes such as maternal smoking, alcohol consumption, anticonvulsant drug use, and nutrient deficiencies (eg, folate) have been linked to facial clefts. The risk also increases with parental age, especially when older than 30 years, with the father's age appearing to be a more significant factor than the mother's age. Nevertheless, most presentations are of isolated patients within the family without an obvious etiology. While the normal embryologic development of the face is detailed in Head and Neck Embryology, a brief outline relevant to the formation of facial clefts follows. In short, the branchial arches are responsible for the formation of several areas, including the mouth and lip. Mesenchymal migration and fusion occurs during weeks 4-7 of gestation. The first branchial arch is responsible for the formation of the maxillary and mandibular processes. The maxillary and mandibular prominences form the lateral borders of the primitive mouth or stomodeum. Mesenchymal migration and fusion of the primitive somite-derived facial elements (central frontonasal, 2 lateral maxillary, mandibular processes), at 4-7 weeks gestation, are necessary for the normal development of embryonic facial structures. When migration and fusion are interrupted for any reason, a facial cleft develops along embryonic fusion lines. The embryonic development of the primary palate (lip and palate anterior to the incisive foramen) differs from the secondary palate (palate posterior to the incisive foramen). The developing processes of the medial nasal prominence, lateral nasal prominence, and maxillary prominences form the primary palate. Fusion occurs, followed by "streaming" of mesodermal elements derived from the neural crest. In contrast, the secondary palate is formed by the fusion of palatal processes of the maxillary prominence alone. The difference in embryonic development suggests the possibility of differing degrees of susceptibility to genetic and environmental influences and accounts for the observed variation in incidences. In summary, a bilateral cleft lip results from the failure of fusion of the medial nasal prominences with the maxillary prominences bilaterally. Kernahan developed a classification scheme in which the defect can be classified onto a Y-shaped symbol. In this diagram, the incisive foramen is represented as the focal point. This system has been applied to both cleft lip and palate. As with the unilateral cleft, a wide range of clinical presentations of the bilateral cleft lip and palate is possible, from the simple microform cleft to the complete cleft bilaterally involving the lip, alveolus, palate, and nose. Bilateral cleft lip is typically classified as either complete or incomplete. In addition, the cleft may present with varying degrees of asymmetric involvement of the lip and palate. 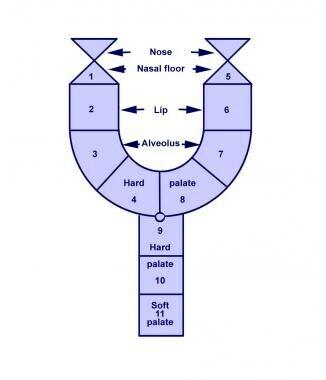 Any degree of combination of involvement of the lip, primary palate, and secondary palate can exist. Recognizing these potentially asymmetric variations is essential in planning operative treatment and evaluating postoperative results. In the complete form of clefts, the premaxilla is unrestrained by the lateral maxillary segments and the vomer grows anterior to the lateral segments. This distorts the alar cartilages away from the nasal tip and stretches the alae across a widening cleft. The columella is significantly deficient, can be virtually nonexistent and without a distinct demarcation from the prolabium, which also is vertically deficient. No prolabial muscle (with the possible exception of depressor septi), philtral columns, dimples, or Cupid's bow is present. No nasal floor is present, as the cleft continues through the palatal shelf along either side of the vomer through the soft palate. Orthodontic treatment can be initiated a few weeks following birth, prior to surgical intervention. Other adjunct procedures include lip adhesion, presurgical orthopedics, primary nasal correction, and nasoalveolar molding. These procedures attempt to reduce the deformity. Nasoalveolar molding is the active molding and repositioning of the nasal cartilage and alveolar processes with an appliance. This orthodontic intervention takes advantage of the plasticity of the cartilage that likely results from residual maternal estrogens. Presurgical nasal alveolar molding allows repositioning of the maxillary alveolus and surrounding soft tissues in hopes of reducing wound tension and improving results. Definitive repair is delayed until approximately 3 months of age, depending on physician comfort. A multidisciplinary approach should be carried out over a period of several years for patients with cleft lip. This multidisciplinary treatment team should include specialists in audiology, ENT, and speech therapy, among others. The key difference between the treatment of unilateral versus bilateral cleft lips centers around the concept of aligning the 3 maxillary segments (the lateral lip segments with the prolabial segments). Presurgical orthopedics may be used to prevent the maxillary segments and premaxilla from collapse. The most common appliances used are nasoalveolar molds and intraoral fixation devices. Botulinum toxin is currently being investigated to decrease tension in cleft repair. In general, bilateral cleft lip repair techniques have been modified from unilateral cleft lip repair techniques. If the repair is staged, the more severe side is repaired first, and the second side is repaired approximately 3-6 months later. Patients born with a cleft lip should undergo surgical repair unless otherwise contraindicated. The goal of reconstruction is to establish normal morphologic facial form and function in order to provide the optimal conditions for the development of dentition, mastication, hearing, speech, breathing, and psychosocial status. Understanding normal lip and nasal anatomy is essential to recognize the distortion caused by a facial cleft. The elements of the normal lip include the central philtrum, which is demarcated laterally by the philtral columns and inferiorly by the cupid's bow and tubercle. Just above the junction of the vermilion-cutaneous border is a mucocutaneous ridge referred to as the white roll. Within the red lip are 2 distinct areas: the dry vermilion (the more keratinized portion of the lip that is exposed to air) and the wet mucosa. The primary muscle of the lip is the orbicularis oris. It has 2 well-defined components: the deep (internal) layer and the superficial (external) layer. The deep fibers run circumferentially from commissure (modiolus) to commissure (modiolus) and function as the primary sphincter for oral feeding. The superficial fibers run obliquely, interdigitating with the other muscles of facial expression to terminate in the dermis, and function to provide subtle shades of expression and precise movements of the lip for speech. The superficial fibers of the orbicularis decussate in the midline and insert into the skin lateral to the opposite philtral groove, forming the philtral columns. The resulting philtral dimple is centrally depressed, as no muscle fibers directly insert into the dermis in the midline. The tubercle of the lip is shaped by the pars marginalis, the portion of the orbicularis along the vermilion forming the tubercle of the lip with eversion of the muscle. In the upper lip, the levator labii superioris contributes to the form of the lip. Its fibers arise from the medial aspect of the infraorbital rim and sweep down to insert near the vermilion cutaneous junction. The most medial fibers of the levator labii superioris sweep down to insert near the corner of the ipsilateral philtral column and vermilion-cutaneous junction, helping to define the lower philtral column and the peak of the Cupid's bow. The nasal muscles are equally important. The levator labii superioris alaeque nasi arises along the frontal process of the maxilla and courses inferiorly to insert on the mucosal surface of the lip and ala. The transverse nasalis arises along the nasal dorsum and sweeps around the ala to insert along the nasal sill from lateral to medial into the incisal crest and anterior nasal spine. These fibers join with the oblique fibers of the orbicularis and the depressor septi (nasalis), which arises from the alveolus between the central and lateral incisors to insert into the skin of the columellar to the nasal tip and the footplates of the medial crura. A bilateral cleft thus disrupts the normal termination of the muscle fibers that cross the embryologic fault line of the maxillary and nasal processes, resulting in symmetric but abnormal muscular forces and altering the equilibrium that exists with the nasolabial and oral groups of muscles. With an unrestrained premaxilla, the deformity accentuates with differential growth of the various elements. The alar cartilages are splayed apart and rotate caudally, subluxed from the normal position. Consequently, the nasal tip broadens, the columellar is foreshortened, and the alar bases rotate laterally and cephalad. Malnutrition, anemia, or other pediatric conditions that result in the patient's inability to tolerate general anesthesia are contraindications to this procedure. Cardiac anomalies that may coexist must be addressed prior to the lip repair. Canfield MA, Honein MA, Yuskiv N, et al. National estimates and race/ethnic-specific variation of selected birth defects in the United States, 1999-2001. Birth Defects Res A Clin Mol Teratol. 2006 Nov. 76(11):747-56. [Medline]. Dolk H, Loane M, Garne E. The prevalence of congenital anomalies in Europe. Adv Exp Med Biol. 2010. 686:349-64. [Medline]. Tanaka SA, Mahabir RC, Jupiter DC, Menezes JM. Updating the epidemiology of cleft lip with or without cleft palate. Plast Reconstr Surg. 2012 Mar. 129(3):511e-518e. [Medline]. Carstens MH. Functional matrix cleft repair: a common strategy for unilateral and bilateral clefts. J Craniofac Surg. 2000 Sep. 11(5):437-69. [Medline]. Noordhoff MS, Cohen M, eds. Bilateral cleft lip. Mastery of Plastic and Reconstructive Surgery. 1994. 1:566-80. American Society of Plastic Surgeons (ASPS). 2007 Reconstructive Surgery Procedures and Reconstructive Breast Surgery. 2008. ASPS Web site. Available at http://www.plasticsurgery.org/Media/Press_Kits/Procedural_Statistics.html. Accessed: March 10, 2009. Dixon MJ, Marazita ML, Beaty TH, Murray JC. Cleft lip and palate: understanding genetic and environmental influences. Nat Rev Genet. 2011 Mar. 12(3):167-78. [Medline]. [Full Text]. Grosen D, Chevrier C, Skytthe A, et al. A cohort study of recurrence patterns among more than 54,000 relatives of oral cleft cases in Denmark: support for the multifactorial threshold model of inheritance. J Med Genet. 2010 Mar. 47(3):162-8. [Medline]. [Full Text]. Rullo R, Festa VM, Rullo R, et al. Prevalence of dental anomalies in children with cleft lip and unilateral and bilateral cleft lip and palate. Eur J Paediatr Dent. 2015 Sep. 16 (3):229-32. [Medline]. American Cleft Palate-Craniofacial Association. Parameters for Evaluation and Treatment of Patients with Cleft Lip/Palate or Other Craniofacial Anomalies. 2000. ACPA Web site. Available at http://www.acpa-cpf.org/teamcare/Parameters00rev.pdf. Accessed: March 10, 2009. Mulliken JB. Bilateral complete cleft lip and nasal deformity: an anthropometric analysis of staged to synchronous repair. Plast Reconstr Surg. 1995 Jul. 96(1):9-23; discussion 24-6. [Medline]. Nakajima T, Yoshimura Y, Sakakibara A. Augmentation of the nostril splint for retaining the corrected contour of the cleft lip nose. Plast Reconstr Surg. 1990 Feb. 85(2):182-6. [Medline]. Cutting C, Grayson B, Brecht L, et al. Presurgical columellar elongation and primary retrograde nasal reconstruction in one-stage bilateral cleft lip and nose repair. Plast Reconstr Surg. 1998 Mar. 101(3):630-9. [Medline]. McIntyre JK, Sethi H, Schonbrunner A, Proudfoot J, Jones M, Gosman A. Number of Surgical Procedures for Patients With Cleft lip and Palate From Birth to 21 Years Old at a Single Children's Hospital. Ann Plast Surg. 2016 May. 76 Suppl 3:S205-8. [Medline]. Bardach J, Salyer KE. Surgical Techniques in Cleft Lip and Palate. 2nd ed. Chicago: Mosby Yearbook; 1991. Berkowitz S, ed. Cleft Lip and Palate. San Diego, Calif: Singular Publishing Group Inc; 1996. Centers for Disease Control and Prevention (CDC). Cleft Lip and Cleft Palate. CDC Web site. Available at http://www.cdc.gov/ncbddd/bd/cleft.htm. Accessed: April 13, 2009. Centers for Disease Control and Prevention (CDC). National Estimates of and Racial and Ethnic Variations Among Selected Birth Defects. CDC Web site. Available at http://www.cdc.gov/ncbddd/bd/keyfindings/race.htm. Accessed: April 13, 2009. Cohen M, Smith BE, Daw JL. Secondary unilateral cleft lip nasal deformity: functional and esthetic reconstruction. Journal of Craniofacial Surgery. 2003. 14(4):584-93. [Medline]. Cragan JD. Epidemiology of Orofacial Clefts. Centers for Disease Control and Prevention Web site. Available at http://www.cdc.gov/ncbddd/bd/macdp/am_940_Cragan.pdf. Accessed: April 13, 2009. Da Silveira AC, Oliveira N, Gonzalez S. Modified nasal alveolar molding appliance for management of cleft lip defect. Journal of Craniofacial Surgery. 2003. 14(5):700-3. [Medline]. Grabb WC, Rosenstein SW, Bzoch KR, eds. Cleft Lip and Palate. Boston: Little Brown & Company; 1971. Pham AM, Senders CW. Management of bilateral cleft lip and nasal deformity. Curr Opin Otolaryngol Head Neck Surg. 2006 Aug. 14(4):278-82. [Medline]. Intraoperative technique. (A) The anatomic landmarks are tattooed and the planned incisions are marked. (B) The orbicularis is dissected from the overlying skin and divided into bundles to allow interdigitation with its opposing element. Inferiorly, an element of the muscle is left attached with the triangular vermilion flap used to create a Cupid's bow. (C) The prolabial flap is developed. The lateral lip elements of the prolabium are discarded and the mucosal flaps are turned over to create a labial sulcus. (D) The lower lateral cartilages are freed from the overlying nasal skin from the base of the ala and columella. The nasal domes are approximated to each other and the cartilages are suspended from the upper lateral cartilages. (E) The series of interdigitating bundles of the orbicularis muscle are approximated to each other. (F) The skin is inset with a series of fine nylon sutures, which are removed 5-7 days postoperatively if a skin adhesive is not used. Xeroform gauze bolsters are placed as a temporary nasal stent. Preoperative and postoperative images of a child born with a complete bilateral cleft lip and palate. Note that the prolabial width increases because of the tension. Ideally, the initial width should have been set narrower. The authors and editors of Medscape Reference gratefully acknowledge the contributions of previous authors Kara K Criswell, MD; Bryan K Criswell, MD; and Mimis Cohen, MD, FACS, FAAP to the development and writing of this article.